This website has been created by the Spirituality and Well-being Advocacy Group. Contact us with questions, feedback, ideas. A society which recognises and responds to the importance of spiritualty (as defined by diverse cultural worldviews) to well-being. To provide a well researched evidence base that will inform dialogue to support the development of policy frameworks and actions that recognise the importance of spirituality to individual and community well-being. 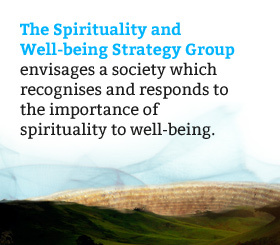 To develop a strategic New Zealand Spirituality and Well-being forum that can engage with wider stakeholders and make informed contributions to advance discussion of spirituality and well-being. We will continually acknowledge that spiritual views are culturally defined and will therefore reflect the context of different individuals/families, communities. For example Maori focus on wairuatanga which may or may not include religious beliefs. Our work will include all ethnic groups living in New Zealand, but we will maintain a particular focus honouring the principles embedded in the Treaty of Waitangi (1840) by including a strong indigenous focus.